Today let's paint the Black-eyed Susans that are incredibly still blooming in a garden down the road from me even at this late date. Though I have not seen butterflies recently as it's early October, I'm going to add a pretty one that I saw in my yard a few weeks ago. Normally I begin a painting with the background, but this time, I just want to dive in and do those pretty flowers. 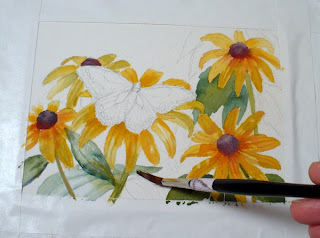 Using a wet-into-wet technique and red, yellow and blue, all the colors I need can be mixed right on the paper. Click the image to see it closer. Next, I add the leaves. Some are in shadow and some in the sunlight. Those that are facing the sky in the sunlight get a wash of pale blueish green since they reflect the blue sky. The leaf colors are mixed from yellow and blue. 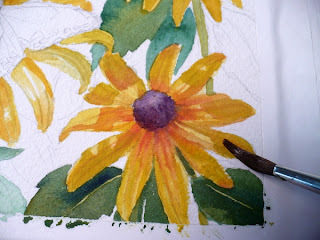 I used Winsor Blue, French Ultramarine and Cadmium Yellow. I like the effect of dappled sunlight on flowers so I brushed in some shadows on the petals. 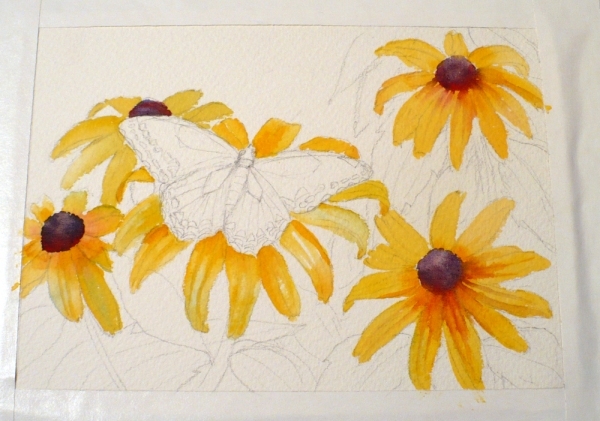 Yellow has to be the most difficult of all the colors to paint in shadow. It has a very short value range so it's not possible to get it very dark. Sometimes the yellow is more greenish in shadow and sometimes more orange. The trick is to look very carefully to see which it is. These flowers have both green-yellow and orange-yellow in the shadows, so I add blue and red to my yellow depending on how it appears to me. For the butterfly, I painted it almost entirely blue first, then when dry, added the darks and details. Now the painting is complete. I hope you enjoyed this short demo. 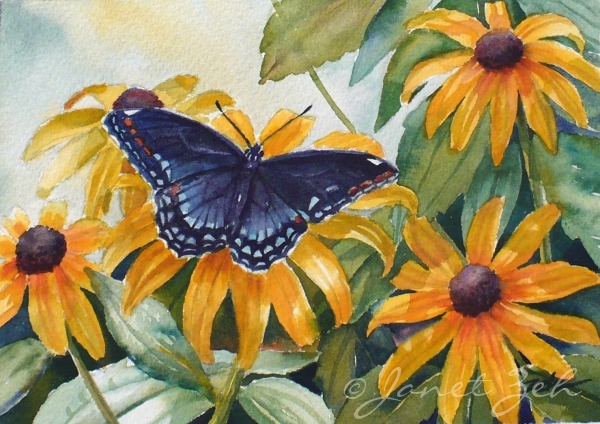 Butterfly and Black-eyed Susans is sold, but you can contact me to have one made just for you. Wow! It looks amazing! Great work!